I wonder, does anybody actually click “Yes”? Nobody likes to have a TV show broken into with some non-sequitur thought about reverse mortgages. Nobody likes clicking on a YouTube video only to have to wait for 30 seconds through a commercial. Nobody likes having pop-up windows get between them and the article they’re trying to read. Nobody likes having to clean out their mailbox (literal or digital) of the 99% of the crap that’s cluttering it up. And nobody likes to have their smartphone constantly vibrating with ad-mails and ad-texts (well…depending on where they carry their phones…almost nobody). When you interrupt somebody, especially with an ad, you’ve already put them in a foul mood. Not the greatest state in which to sell them something. And that’s why everybody hates ads. The only people who seem to like them are those that make them. And they only like the ones they make. Or the funny ones. That’s also why there are spam filters. And that’s why there are DVRs, so you can FF through all the ads. 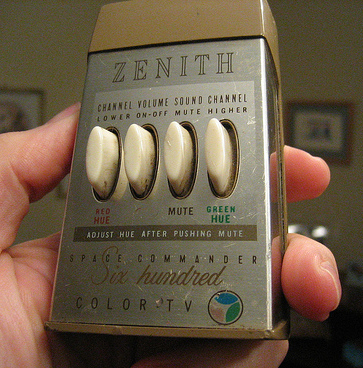 And there have been “MUTE” buttons on TV remote controls ever the advent of the first Zenith Space Commander sixty years ago, which predated the creative revolution in advertising by six years. THAT THIRD BUTTON WAS MY GRANDFATHER’S FAVORITE. It used to be, back in the Mad Men Golden Age of advertising, that advertisers recognized this timeless fact about human nature; people don’t like ads. This recognition was first uttered (supposedly) by David Ogilvy, “Nobody ever bored their customers into buying their product.” But for some reason, the majority of people making ads today seem to think that human nature has changed in recent generations and that people nowadays seem to love to be interrupted by ads. And bored into buying products. Now, I’m not a behavioral scientist (even with my degree in it) and I haven’t actually read any studies to the contrary, but it seems to me that people still don’t like being interrupted. That hasn’t changed. That app is still working in Human Brain OS 1.0. So, what’s an advertiser to do? What’s the anti-anti-spam technology? According to my first ad mentors, Ray Engle and Lee Clow, and to countless other genii of the Golden Age, the answer was simple: Make it good. You just pissed somebody off by interrupting them–you can’t get around that–so you’d better make it worth it. And “worth it” doesn’t mean telling us about all of your J.D. Power Awards. The “worth it” is where creativity in marketing comes in. Make it entertaining. That was the giant, forehead-slapping discovery made by Ogilvy and Bill Bernbach and all the ad people who weren’t working at that hack-factory, the Sterling Cooper Agency, in 1962. Why are funny ads ten times more successful than information-only ads? (There actually have been studies to measure this.) Because they reward us for listening. They respect us as intelligent people. They know they just interrupted us. So they give us a peace offering. And then we are not so inclined to hit mute, or change the channel, turn off the TV, or click “skip” on the pop-up window. 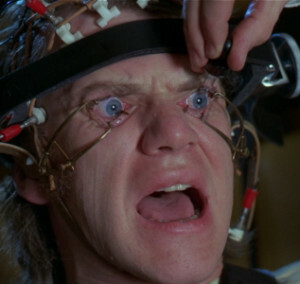 Want to make somebody watch your ad? Then make them laugh. Or cry. Or scared. Or at least feel entertained. Other than kidnapping them, duct taping them to a chair, and clamping their eyelids open, there’s no other way to do it. Legally anyway.